With flu season rapidly advancing, attention will begin to shift focus toward what novel ideas scientists have developed to protect the public health. Now, it would seem, investigators at the Dana-Farber Cancer Institute are looking to take the lead in this critical discussion because they have recently published data on the discovery of a new type of immune antibody that can evolve rapidly to neutralize a broad range of influenza virus strains—including those the body hasn't yet encountered. The revelation of the body's ability to make the adaptable antibody suggests potential strategies for creating improved or even universal influenza vaccines. The new antibody, named mAb 3I14, is a broadly neutralizing antibody (bnAb), so-called because it can recognize and disable a diverse group of the 18 different strains of influenza virus that circulate the globe. The Dana-Farber team reported that the 3I14 antibody demonstrated it could efficiently neutralize the two main types of influenza A virus—groups 1 and 2—and protected mice against lethal doses of the virus. 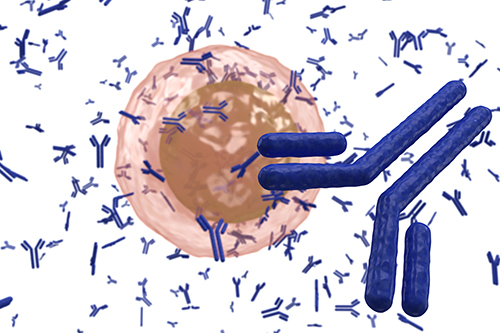 The 3I14 antibody is made by the human immune system's memory B cells—immune cells that circulate in the blood and reside within the spleen and bone marrow. When an individual is exposed to an infectious agent or receives a vaccine made from pieces of that agent, B cells respond to the invaders and can generate a memory of the particular type or strain. Pools of these memory B cells constitute a reserve defensive force that can quickly recognize and attack the microbe or virus should it enter the body again. Unfortunately, influenza’s hypermutability makes it difficult to protect against one-time vaccination strategies. Viral changes occur every flu season and are responsible for the seasonal flu that we are vaccinated against yearly. The more dramatic changes that occur when new viruses emerge from animal and bird reservoirs are responsible for potentially more severe pandemics, such as the deadly H1N1 strain that emerged in 2009. The discovery of the new bnAbs came after senior study investigator Wayne Marasco, M.D., Ph.D., a cancer immunologist and virologist at Dana-Farber, along with his colleagues took blood samples from seven blood bank donors that were shown to harbor these types of antibodies and challenged their immune B cells in the laboratory with an array of flu viruses. The researchers ultimately identified one B-cell population “that recognized all the strains we screened against it,” Dr. Marasco said. Sorting through the B cells' DNA, the researchers isolated the gene that carried the instructions for creating the 3I14 antibody. The research team found that the antibody could bind to the unchanging stem portion of flu viruses. Moreover, they reported that the antibody's genetic makeup gave it the flexibility to adapt or evolve, through mutations, to neutralize a myriad of flu viruses.